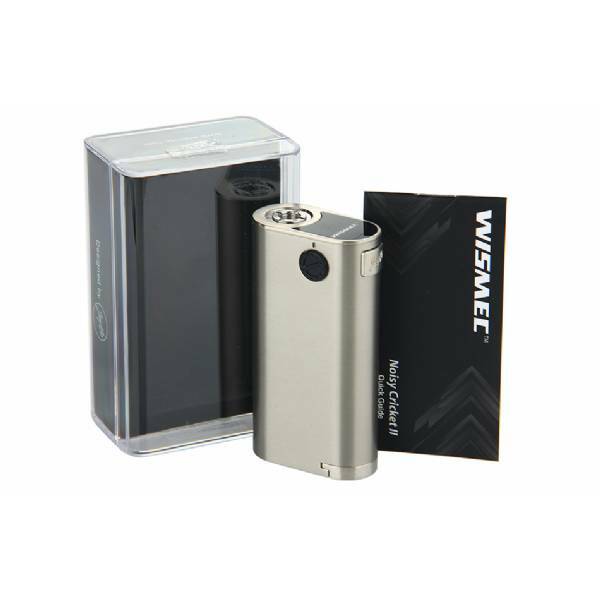 WISMEC - Noisy Cricket II-22 MOD - Silver W/O Battery: unmatched powerwul and safe box mod. WISMEC - Noisy Cricket II-22 MOD - Silver is the new member of the Cricket II series, more intelligent and multifunctional than previous models. This fantastic MOD box works with two 18650 mAh batteries and has a 510 sprung connector instead of potentially damaging hybrid connector, enabling Noisy Cricket 2 to use atomizer heads as well. This new version proposed by Wismec, in addition to deliver power bypassing series batteries, also offer voltage-adjusting and batteries in parallel mode. The battery lid, located at the bottom, may be configured in series, or in parallel (8,4v or 4,2v). When device is power-off (5 clicks), hold down for 5 seconds to switch from a voltage value to bypass mode.